I came across these pictures on WeHeartIt.com the other day and they really got me thinking. What do you need to look like in order to be considered beautiful? 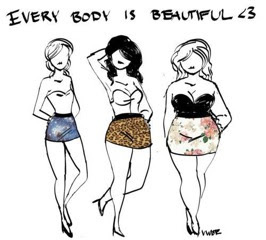 I agree with the second photo, every body is beautiful. Coming from an Italian and Portuguese background, I am considered to be “too skinny” by my family members. To other people I am seen as “normal”. To my doctor I am seen as “healthy”, given my height and weight measurements. Personally, I am comfortable in my own skin and really, isn’t that what matters most? Would I like to be a little more curvaceous? Yes, I would. It would be nice to look more like a woman instead of a 14-year-old girl that hasn’t fully developed, but hey c’est la vie! Beauty isn't about how much you weigh or what you see on T.V. It’s about being comfortable in your own skin, being healthy, and being confident. Beauty is how you see yourself. Beauty is loving yourself. To me, to consider us as beautiful is by being ourselves. There are reasons why we are being created this way. We just have to put in the effort to explore ourselves.